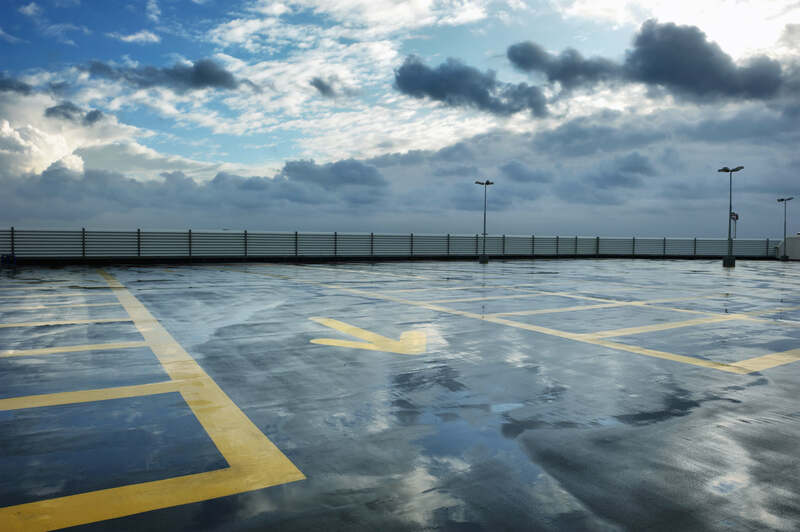 As we begin to transition into the fall and winter months, it is crucial to consult your maintenance checklist to ensure your parking lot is prepared for the changing weather. Some maintenance tasks will be difficult to accomplish when the rain starts to fall, creating a time-sensitive schedule your facility should abide by. Curcio Enterprises lists the items you should cross off your checklist this fall to get your parking lot ready for winter. Before the rainy season starts, make sure your drains are working properly. Water can cause long-term damage to asphalt, and it can also add more risks for drivers and pedestrians. Parking lot drainage tends to be overlooked, as it is not a noticeable feature of the facility if done properly. Sometimes, there are clear indicators that your drains need attention, while other times the issues may not be glaring. Determine solutions before it becomes a problem by ensuring your drainage is working effectively and correctly all year, regardless of the weather. 2. Fix cracks and potholes. Cracks will only become more prominent in rainy weather, as water can be detrimental to asphalt. Reduce maintenance costs and maintain appearance with parking lot seal coating to preserve pavement. Before inclement weather starts, it is ideal to apply slurry seal to further protect your parking lot. The seal stops the damaging effects of weather and is resistant to oil and gas. Potholes should be filled immediately before they become an even bigger problem. Because they can cause harm to drivers and pedestrians, they open the door for risk at your facility. Rain can make potholes worse and also present danger to anyone on your premises. Fill them as soon as the cracks begin to form to keep your lot safe and presentable. During autumn and winter, sustaining your parking lot’s appearance is an important part of maintenance. Leaves can bunch up in areas, making it difficult for pedestrians to navigate your lot. Your facility should not have large piles of leaves in every corner. You should also maintain weeds and other vegetation that grow in the cracks of pavement. When it rains, leaves become slippery and can collect other debris from the pavement. Sticking to a regular power sweeping and pressure washing schedule will keep your facility looking spotless no matter the season. A clean facility is about more than making sure the appearance of your parking lot is appealing. Leaves can create damage on your lot’s surface, creating additional repair costs in the future. Stick to a regular maintenance schedule to remove debris and be prepared for seasons to come. 4. Order the proper signs. Believe it or not, signage plays an important role in managing your parking lot repair costs. Do you have signs in your lot prohibiting certain types of vehicles from entering? Heavier vehicles, such as semi-trucks or garbage trucks, can distort or crack asphalt. You can minimize and/or control the traffic that enters your parking lot by posting the proper signs instructing drivers of which vehicles are allowed. You can expect premature maintenance costs if too many heavy vehicles regularly access your parking lot. Does your parking lot need maintenance before the weather starts posing challenges? Contact Curcio Enterprises, Inc. to keep your parking lot running smoothly and looking its best year-round. We are a dependable, licensed, and insurance business that has been serving the parking industry since 1975.